We've seen numerous announcements of tablet computers in recent weeks, as the R&D labs of the world push out their hastily assembled attempts at competing with Apple's game-changing iPad. But are any of them up to the job? Last week alone saw ViewSonic, Toshiba and Samsung all officially unveil new models of keyboard-less computer, with a mish-mash of operating systems and screen sizes hoping to somehow build themselves a market in the wake of Apple's market-leading device. 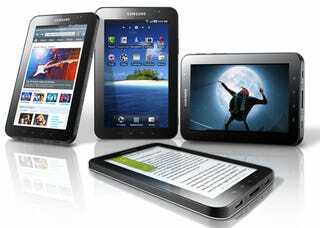 So here's a summary of five of the best tablets out there and on the way this year. Or, to put it another way, the iPad +4. The closest Android has got to Apple so far, at least in terms of hype and noise prior to its launch. Officially unveiled at IFA this week, the Samsung Galaxy Tab features a 7" screen and the latest 2.2 version of Android at its core. The internals are the same as those of the Samsung Galaxy S, offering the Cortex A8 processor that won so many fans when in mobile phone format. The hardware feature set closely adheres to Apple's template, but also offering a 1.3 megapixel front-facing camera for video chat—despite the fact that not many Android apps currently support the feature. Samsung has confirmed the Galaxy Tab has one big advantage over tablets—access to the Android Market. Much more pocketable than the iPad with only a 7" screen, it's the best Android currently has when looking for a proper iPad competitor. Kat was certainly won over by it at IFA last week. The current tablet king, thanks to making tablet interfaces fashionable and usable. Apple's tablet is typical of an Apple product—polished and beautifully functional as long as you don't want to do anything outside of Apple's closely controlled world. Obviously the big winner here is compatibility with standard apps from Apple's App Store, meaning iPad comes with the world's biggest collection of apps and games from day one. Albeit most of them are upscaled, but high-res iPad reworkings are quickly becoming the norm from most top developers. The hardware is fast and responsive, and although there's no camera, USB connector or Flash support, for casual browsing of your feeds and blogs in Star Trek style there's simply no better option. The killer feature in the ViewSonic ViewPad 100 is dual-booting capabilities with Windows 7 and Android, so you can kill two birds (cell phone nerd, work use) with one stone. The rather outdated Android 1.6 isn't going to stand up against Windows 7 very well, though, which makes us think the Android support here is more of a tagged-on feature to help whip up a bit of excitement among Android fanatics. It'll be good to see Android running on an Intel Atom, though. The main worry here is that the ViewPad 100 is an awkward combination machine, either way too powerful for Android 1.6 or not man enough to operate Windows 7 with ease. And can Android 1.6 really cut it as a tablet OS? ViewSonic had better have one hell of a user interface skin lined up. Another tablet that clones iPad's winning 10-inch screen size, we expect the Toshiba Folio 100 to operate at lightning speed thanks to the coupling of the next-gen Nvidia Tegra 2 chipset and the optimised Android 2.2 as its OS—so it's also fully Flash-enabled. You get a 1.3 megapixel front-facing camera, so you can tell people it's got a front-facing camera. Even if you never, ever, actually use it. Plus there's a mini HDMI port for proper HD media connectivity with your big TV. Its other connectivity options are plentiful—802.11n Wi-Fi, SD/MMC card support, plus there'll be a 3G version launching in Q1 2011. Archos is betting its family farm on Android, with a whole heap of Android tablets on the way. The top of the bunch has to be the Archos 7o, the 7" version powered by the impressive ARM Cortex A8. The media playing history of Archos means you get an over-sized hard drive in here for your massive legacy collection of MP3s, with the Archos 7o capable of housing anything up to a 250GB drive. Android 2.2 is the OS of choice, which ought to be a blisteringly fast experience on the Cortex A8. There's USB and HDMI connectivity, with the 7o able to play 720p HD MP4 files at 30fps. If you look at this one as a big media player rather than a small tablet, it ought to be a winner. You won't be doing much productive business work on its 800x480 display, but having FroYo on a 7" screen should make it a winner for the Android fans.